We had these last week and had to share the yummy goodness! Enjoy!! Stir tequila, lime juice, orange liqueur, and simple syrup together in a pitcher with a lid; add jalapeno pepper and thin cucumber slices. Refrigerate at least 1 hour. Run a wedge of lime along the rim of each of four pint glasses. 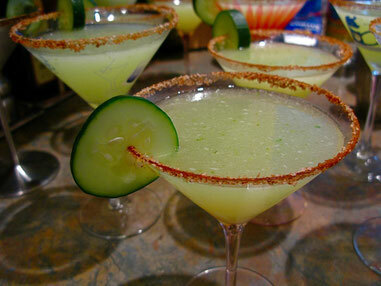 Rim glass with Cayenne pepper.